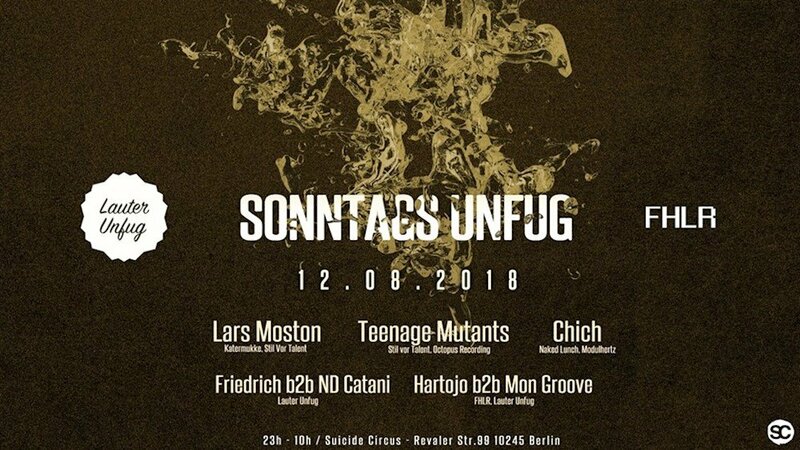 This event "Sonntags Unfug Open Air mit Teenage Mutants, Lars Moston uvm" @ Suicide Circus has already ended on 08/12/2018. Here you can find upcoming events for this location! The deadline at our guest list has ended on 08/12/2018 at 6:00 PM. The deadline at our lottery has ended on 08/12/2018 at 3:00 PM. After 5 years in a solo project, Mainz based Christian Samujlo teamed up and comes in a double pack with double power and double vibes: Teenage Mutants. Praised in the worldwide clubbing scene for their grooves and composition, Teenage Mutants appear in the catalogues of many great labels such as Stil Vor Talent, Suara, Katermukke, Octopus and Click. Before their album on Stil Vor Talent hitting the charts in 2017, their EP "Chapter Two" on the same label got a sophisticated recognition from national and international artists and critics. Atmospheric sounds, grounded basslines and moving grooves characterize their techno productions and stage appearances. Moonbootique, Nervous Records, Audio Safari, Defected, Stil Vor Talent, Katermukke, the list of labels Lars Morton has contributed to is long, diverse and exciting as well as his productions and remixes for artists like Purple Disco Machine, Julian Wassermann, HRRSN, Mike Mago, Himselfher, Edu Imbernon, Claus Casper, Tony Senghore and Fort Knox 5, which brought his releases recurring spots on the sales charts. Focussed on House and Deep House, with his charismatic stage presence and thoughtful track selection, deep Disco grooves and demanding bangers as time and place permits, Lars convicted plenty crowds around the globe. For support we will be joined by Chich, who's with his own label Modulhertz rec rooted in and part of the electronic music scene for over 20 years now. DJing worldwide, by his studio productions or even, for being, over the years, one of the main techno faces in Luxembourg, promoting events and the scene in general since 1989. From the roster of party host Lauter Unfug we will be joined by ND Catani and FRIEDRICH as well as Fehler-Musik heads Hartojo and Mon Groove. Der Suicide Club liegt auf dem berühmt-berüchtigten RAW Gelände und begrüßt Gäste aus aller Welt. Auf die Ohren gibt es feinen Elektro-Sound und wenn es das Wetter zulässt, wird auch unter freiem Himmel gefeiert.